Ever since I read Treasure Island as a child I developed a great interest in the sea. I always felt that it was so mysterious and poetic and devoured books about shipwrecks (as I still do now), pirates and battles at sea. This was greatly assisted by the fact that my Dad was in the navy for all of my childhood, sailing off to foreign lands (like the Falklands, from where he sent me a cuddly penguin I still cherish). To this day I still adore anything nautical, in fact I met my other half on a sailing trip and we both work for the same maritime organisation (him training operational staff, me, rather less excitingly, working in the Press Office). It’s strange to think that shipping incidents and people in distress at sea are now the things that wake me up in the middle of the night when I’m on call. 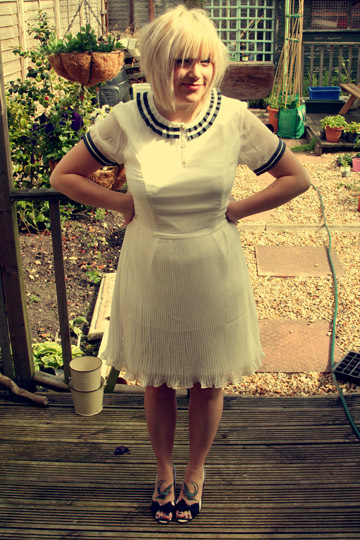 My love of nauticalia definitely extends to my fashion choices; from dresses with boat prints, to Breton tops, to anything that pairs navy and white together. 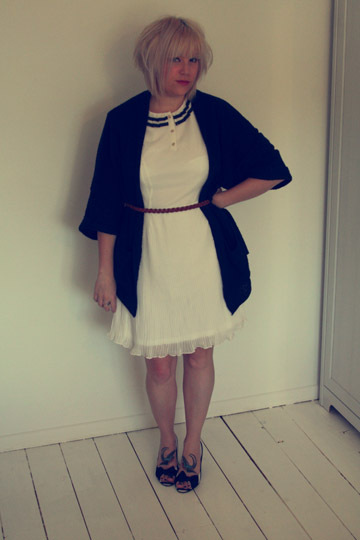 I had been lusting after this gorgeous Vero Moda Sailor Dress on Room 31 for some time, so when they contacted me to ask if I wanted to feature something from their website on my blog it was a very easy choice! 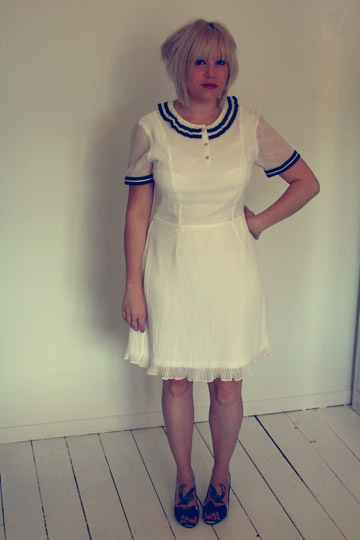 I do feel like a little sailor in it! I’ve raved on about how much I love Room 31 in a previous post so I won’t do it again here but what I will say is that they are well worth a follow on Twitter, not only because they tweet about their lovely stock (and bloggers wearing it!) but also because, if you’re lucky, they do tend to tweet some great discount codes! Their sales are also brilliant, picked up several lovely things in their last one. On a final note, have you spotted my new haircut? I got it chopped on Thursday night, I do like it but I am still getting used to having a fringe! I’ve also spotted that my wrists look so bare in these photos – I’m usually found with several bracelets on at once but I’m currently hunting for the perfect charm bracelet as I have my eye on some items on Essence Charms – I love the little camera charm!